Download Lady Bird in Digital HD from the iTunes store. Lady Bird images are © A24. All Rights Reserved. Teenage girls can be a handful. Considering I used to be one and have two of my own now, I can attest to this statement. Emotions run high and physical bodily changes make things awkward and downright hostile sometimes. Teenagers in general (boys and girls) want more independence and challenge their parents constantly while navigating the slippery slope of freedom with added responsibility. Writer/Director Greta Gerwig gives us a heartwarming, coming of age tale that delicately balances the intricacies of parent/child relations while writing a love letter to her hometown. Coming to Blu-ray, DVD, and Digital HD this month, it should be necessary viewing for anyone who is a teenager, was a teenager, is the parent of a teenager or plans to be a parent of a teenager. Christine "Lady Bird" McPherson (Saoirse Ronan; Brooklyn) is a senior at a parochial school in Sacramento, CA. She is there on scholarship and is a decent, if average, student. Her Mom, Marion (Laurie Metcalf Roseanne) works as a psychiatric nurse and her dad, Larry (Tracy Letts; The Big Short) is a computer programmer who gets laid off. They don't have a lot of money and with Lady Bird's (a nickname she has given herself) grades it seems she is destined to live at home and go to a California college nearby, the idea of which makes Lady Bird miserable. 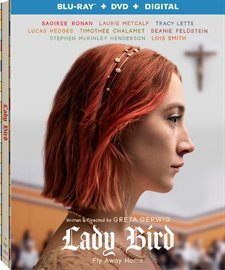 As she navigates her senior year, we see Lady Bird join the Drama club and getting her first boyfriend, Danny (Lucas Hedge; Manchester by the Sea), Losing said boyfriend in a rather shocking way, blowing off her best friend, Julie (Beanie Feldstein; Neighbors 2: Sorority Rising) to hang out with the cool girl, Jenna (Odeya Rush; The Giver) in order to get closer to her new crush Kyle (Timothee Chalamet; Call Me By Your Name) and losing her virginity to the aforementioned Kyle. All of this seems to be the usual fodder for a coming of age movie but the real drama here is the love/hate relationship between Lady Bird and Marion. As we watch Marion become increasingly frustrated with and critical of Lady Bird and listen as Lady Bird asks her mother, " Why do you hate me?" we can't help to feel the anguish and heartbreak between these two females. Ronan is excellent as the lead role and the talent we saw from her in Brooklyn is once again evident here. She runs the gamut of teenage emotion – happiness, giddiness, sadness, anger, despair – and brings the audience along on her journey. Metcalf is the perfect complement to Ronan and their chemistry is as palpable and volatile as most mother/daughters. Letts, Feldstein, Hedge, and Chalamet all add another layer to this complex story and their performances are terrific. The Blu-ray is presented in 1080p high definition video with a 1.85:1 aspect ratio. The outdoor shots are bright and full and showcase what is meant to be the Sacramento suburb. The DTS-HD master audio 5.1 is outstanding with the dialogue clearly heard in the center channel and the background (including a terrific score) subtly sitting in the side channels. 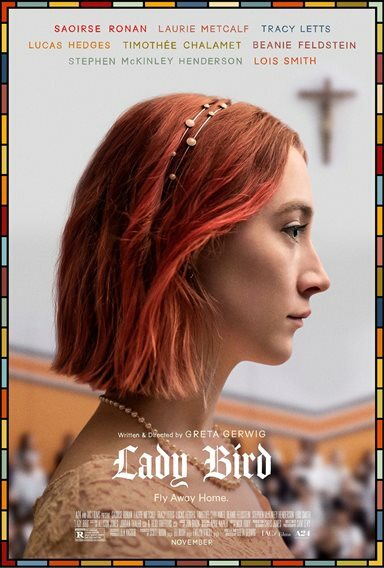 The combo pack only offers two extras - Audio Commentary with Writer-Director Greta Gerwig and Cinematographer Sam Levy and "Realizing Lady Bird" Featurette – which are both interesting and informative. As I am currently experiencing similar situations with my teenage daughter, this film hit close to home and was difficult for me to watch as I relive some painful emotions of heartbreak from a headstrong and rebellious child. However, this statement is not meant to diminish the skillful way Gerwig broaches the sensitive subjects and emotions displayed by this truly talented cast. It merely means she got it exactly right. Even if you don't have kids, you would have to have a cold, stone heart to walk away from this movie unaffected.